Oliver Burke has been handed a terrific confidence boost ahead of the new season by signing an extended contract. Nottingham Forest last week offered the young winger a three-year professional deal nine months after he signed professional terms with the City Ground club. The move underlines the faith Forest have in the exciting 18-year-old who won the Melton Times Junior Sports Personality of the Year award in June. The Melton footballer made three senior appearances for the Reds last season and made his debut aged 17 last October in the Carling Cup tie at Spurs. Burke also contributed heavily to a very successful campaign for the under 21s last season, and spent time on loan at League One side Bradford. 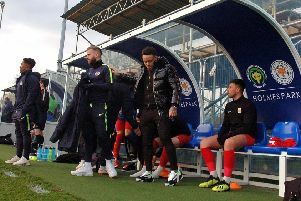 Nottingham Forest academy manager Gary Brazil believes Burke, who is back in training after three weeks out with a minor injury, will make a real push for the first team in the coming campaign. He told the club website: “Oliver has made fantastic progress in the last year, developing a lot physically and improving his understanding of what he needs to do to make the most of his attributes.